The Museum of the Soldier got it’s start with three original founders, local military historians James Waechter, Brian Williamson, and Michael McBride. They began culling their efforts in the early 1980s and started providing displays for local schools and events. For 15 years this group provided traveling displays with a goal of preserving and presenting histories of the men and women, the families and workers back home, during times of war, of peace, and peace keeping. Whenever a display was held the question was always asked, "Where is the Museum? We would like to visit.” The only answer to this question was, “There isn’t one, but maybe in the future.” The future came to be in 1997. 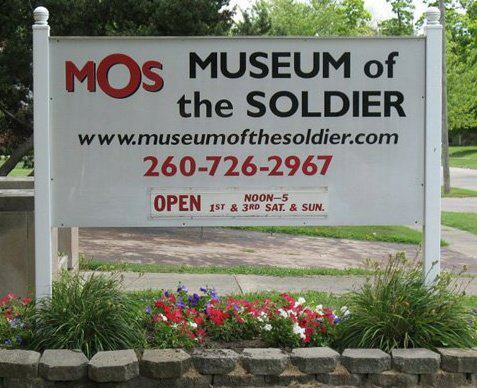 The Museum of the Soldier, Inc., now a federally recognized non-for-profit organization, received the deed to the former Coca Cola bottling plant in Portland, Indiana. This gift was made through a generous contribution of the Hondo Inc. corporation, and it's parent company of Coca Cola. What began as a traveling display now had a place to display exhibits on a permanent basis. Finally the MOS group had a real home. Although the building was basically a sound structure, many items needed upgrading, repairing, or complete replacement. The building which had been used for storage for 12 years was now a labor of love and dedication. Long range plans include permanent exhibits highlighting local military history, a large and flexible main gallery space with changing exhibits, a multi-purpose area for lectures, and other dioramas. Plans also include focusing on the local Civilian Conservation Corps (CCC) program of the later 1930’s and the early 1940’s, one of only two black CCC camps in Indiana.